Aikido in Victoria began in the spring of 1975 at the University of Victoria (UVic). The first instructor was Gary Mols Sensei who had just moved from Hawaii and was suprised to find that there was no club here. While attending UVic to obtain a teaching degree, he decided to start a course through the Athletics and Recreation Department. This first course cost $5 a semester! In 1977 Gary decided to expand practice times by renting space from the Victoria Judo club which was located on Johnson Street for many years. One of the early experiences was a group road trip to Seattle to practise at Hirata Sensei’s dojo. The exposure to more senior students was an eye-opener for a new dojo just starting out. In 1979 Gary’s family responsibilities led to the search for a new instructor. In Montreal at the time, Ishiyama Sensei was invited to move to the West Coast with numerous promises, including a teaching position at UVic. When he arrived he found that some of the promises were not quite what he thought(!) but he threw himself wholeheartedly into expanding the student body. For many years Ishiyama Sensei expended a tremendous amount of time and effort encouraging the technical and spiritual growth of his students. 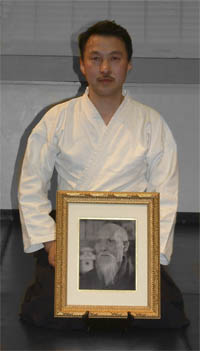 Besides the main dojo and the club at UVic he encouraged the opening of the Camosun College dojo by Larry Dettweiler. In 1981 he organised a trip to Japan for several students. They were given the opportunity to experience Japanese culture and to practice in Taiwan with Lee Sensei, in Osaka with Bansen Tanaka Sensei and in Iwama with Saito Sensei. This was an experience that none of them will forget. In 1986 Ishiyama Sensei moved to Vancouver and passed the responsibility for the club on to Scott MacPhail Sensei. Though no longer in town, Ishiyama Sensei has maintained a close relationship to Victoria Aikikai, providing guidance and inspiration to the students and teachers. Ishu Ishiyama Sensei received Shodan (1st Dan) from Seiseki Abe Shihan (O-Sensei’s calligraphy teacher), 2nd and 3rd Dan from Bansen Tanaka Shihan, and 4th, 5th and 6th Dan by the recommendation of the shihans on the North American Aikido Federation Technical Directors Committee (esp. Yamada, Kanai, and Kawahara Senseis). Ishiyama Sensei has been studying Aikido since 1968. He studied with the late Bansen Tanaka Shihan (one of O-Sensei’s close pre-war disciples), who founded an Aikido dojo in 1936 that later became the Osaka Aikikai Foundation. In North America, he trained closely with Kanai and Kawahara Senseis. He has studied with Yamada, Chiba, Tohei, Nakazono, and Saito Shihans, and received occasional instructions from the late Doshu Kisshomaru Ueshiba and the current Doshu Moriteru Ueshiba over the past 30 years. Ishiyama Sensei has been teaching Aikido since 1973. In 1974, he was invited to teach Aikido by the then National Coach for Judo Canada (Nakamura Sensei) and founded Aikido Kensankai at his dojo, Shidokan Academy of Martial Arts, in Montreal. He also began teaching Aikido at several dojos and colleges in and around Montreal. In 1979, he was invited by then chief instructor Gary Mols (a student of Yoshioka Sensei, Hawaii) to head the Victoria Aikikai (located in Victoria, B.C.) and its affiliated University of Victoria Aikido Club. While Chief Instructor of Victoria Aikikai, Ishiyama Sensei guided and encouraged the growth of local dojos and his students. Among his students still practicing locally are Scott Macphail, Daniel Kempling, Bob Moline, Hilary Dawson, Mike Chin, John Petersen and Gail Macphail. A number of his other Victoria Students have moved to dojos where they now instruct such as Liz McKinlay, Jobe Groot and Michael Smorhay of Vancouver. Another senior student, Larry Dettweiler, is active in Aikido in New Mexico. Ishiyama Sensei moved to Vancouver in 1986, and founded Vancouver West Aikikai (formerly known as Point Grey Aikikai) where he is currently teaching regularly as Chief Instructor. He has also conducted many seminars across Canada. “In 1966, while working on the Island of Molokai in the Hawaiian Islands for VISTA (the US Domestic Peace Corp), I met a local Molokai resident who was an Aikido Nidan. He was a bit of an odd duck. He gave private lessons for a while and would sometimes wander about in his hakama… I remember him putting a nikkyo on me. It HURT!!! In 1968, while attending the U of Hawaii, I took a University Aikido class from a Sensei who was also a member of the Honolulu Aiki Kwai (as they spelled it). Soon after, I started to take Saturday morning introductory classes from one of the founders of Aikido in Honolulu and a former Judo Champion, 80-year-old Yukiso Yamamoto Sensei. He was in the Black Belt Magazine Hall of Fame. He was a very patient man, and encouraged me to take evening classes. My first evening instructor was Nidan Sensei George Chew. George was Hawaiian and was probably in his mid 40’s. He had a very warm and friendly aura about him and looked very much like the legendary Hawaiian surfer and Olympic swimmer Duke Kahanamoku. Chew Sensei reminded me of a Buddha. His style could be described as centered, deliberate, strong, smooth, graceful, friendly, forward, sensitive, but very powerful if he felt he had to demonstrate the “martial aspect” of Aikido. Chew’s classes emphasized harmony, technique and being centered at all times. Once a month at dawn on Sunday, Yoshioka Sensei would take the keener students to his Misogi classes held at the base of Manoa Falls. We would park our cars at the entrance to the park and hike in a kilometer or so. We would carry our bokken with us. One or two of us would sit still under the falling water and try to breath calmly and deliberately while the other Aikidoists would stand in the thigh deep water in a semi-circle and strike and chant for a couple of hundred times before rotating out. (A political reminder is that Tohei Sensei was one of O Sensei’s top “right hand men” in Japan, and had been spreading Aikido outside of Japan in the early 60’s I believe. The schools that Tohei started in North America used the “Six Basic Arts Method”. After O Sensei died (in the Spring of 1969), there was a bit of a power struggle between O Sensei’s son Kisshomaru, and his followers, and Koichi Tohei and his followers who were mostly the local instructors in Hawaii and North America. This tension came to a head; in I think 1974, when I attended a large birthday celebration at the famous downtown Honolulu “floating restaurant”. It was hosted by the local Hawaii Dojos in honor of the visiting Doshu Kisshomaru. Most of the Instructors from Hawaii and many from the mainland US were on hand. Spirits were high and there were many toasts (Johnny Walker Black) and several gifts given to Doshu as he sat serenely at center stage. All of a sudden, unbeknownst to everyone, Koichi Tohei and his followers arrived from the back of the stage to the left of Doshu. I am NOT being melodramatic. This created a HUGE uproar. I still can visualize a high ranking Sensei from the mainland, who seated between me and the stage, was being restrained from going on stage. Insults were hurled, but to everyone’s credit, cooler heads prevailed. Tohei and his entourage soon left. Eventually Tohei Sensei formed his own organization – the Ki Society). “As a result of Tohei’s actions, my dojo’s Chief Instructor Yoshioka announced that “the bo would from now on be called the jo in Hawaii”. It was his simple way of saying that the old leadership of his longstanding friend, Koichi Tohei, would from now on be replaced by the new leadership of Kisshomaru Doshu. This opened the door to visits by Sensei’s whose visits did not have to be approved by Tohei. One very memorable visit was by one of O Sensei’s favourite students Morihiro Saito who was in his later years. He put on an incredible show with the jo and bokken and in the process wore out two of our best students even at his old age. I received my Shodan in December, 1974 the month that my wife Rebecca and I moved to Victoria.